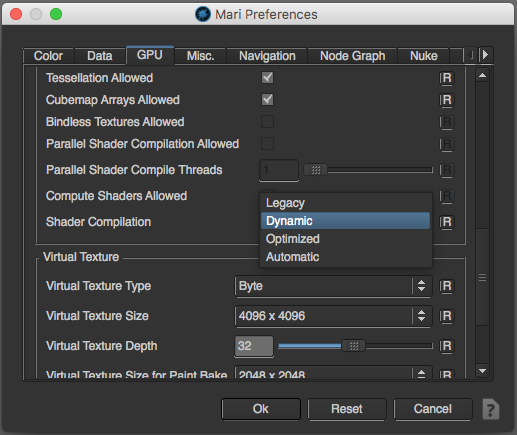 Some complex operations, such as sharing layers or manipulating shader inputs, may incorrectly feedback from the drivers causing Mari to lock-up when completed in the Legacy, Optimized or Automatic shader compilation modes on Mac OS X. When working with complex shader setups in Mari, sometimes a miscommunication between Mari and the drivers may occur which will affect the session's performance. In Legacy, Optimized or Automatic mode, this may cause a lock-up where Mari will appear to be busy but, in most cases, will end up crashing rather than complete the action. The issue appears on Mac OS X and we are currently working with Apple to resolve it as soon as possible. If you experience this issue in a version of Mari predating 3.3v1, you can workaround this by reducing the complexity of your project. We recommend making use of bake point nodes or caching your layer stacks. Through this, you will benefit from non-destructively optimising your projects for better performance. Alternatively, and although destructive, you can flatten your layer stacks into a paint layer in order to achieve similar optimisations. If you do experience this issue in Mari 3.3v1 or above, you may see a warning appear in your UI the next time you reopen Mari, after experiencing a crash while in Legacy, Optimized or Automatic mode. If you select ‘Yes’, please check that in the launched session your shader compilation mode has been automatically switched over. If you select ‘No’ you are advised to change these preferences yourself. If you do need to do this manually, please navigate to the following location in your Mari preferences as shown in the image below.